Today was Picture Day at WLA which means that this is the first time Traveling Choir has worn their outfits and has had their picture taken in them! 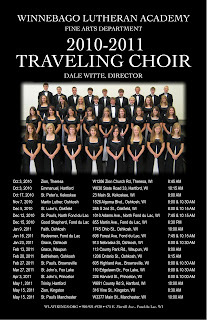 It also means that I can finally publish the poster of TC's 2010-2011 church performance schedule. You may download a poster to print for yourself. I am going to be printing posters and having them sent to all the WLA Associaiton congregations and grade schools as well. If you would like a poster and can't print it yourself, please contact me by email or call me at WLA at 920-921-4930 ext. 310.